Penguin Audio, 2013. 7 hours and 30 minutes on 6 discs. This audiobook includes nine short stories about Kinsey Milhone, Sue Grafton’s famous detective creation. 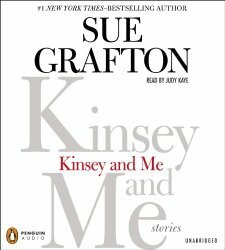 Then in the second part, there are short stories about Sue Grafton herself, as a child with an alcoholic mother, and dealing with her mother’s death. The Kinsey stories are brilliant, with the one exception of the last one which is simply a frame for the old one-twin-always-tells-the-truth-and-the-other-always-lies puzzle. But the rest of the stories are remarkably varied and entertaining, and all have a clever solution. They made very diverting listening as I drove to work. Each time I shut off the CD after the story finished, because I wanted to relish the story I’d just completed. The “and Me” stories are still good and well-written, but the tone is much different. They are about Sue Grafton’s relationship with her alcoholic mother, written in the decade after her death. They are far darker in tone, and are very sad. So as you’re enjoying the detective stories, it’s kind of a downer to finish with these. I wonder if that problem would have been solved by putting the “and Me” stories first and then lightening the tone with some nice murder mysteries. This entry was posted on Saturday, May 24th, 2014 at 10:08 pm and is filed under Audiobooks, Fiction Review, Mystery. You can follow any responses to this entry through the RSS 2.0 feed. You can leave a response, or trackback from your own site.